Glengyle distillery is owned by the Mitchell family...who also own Springbank. Call it naiveté but that was enough to get me to buy a bottle. It's not cheap for a 12 Year Old, even by Ontario standards, but name brand recognition goes a long way, I guess. I may have to stop criticizing THE Macallan and its customers if this keeps up. Finish: medium length, a touch of nuttiness, hazelnuts maybe, then milk chocolate, yielding to a little minerality (slightly chalky), charred lemons, a touch of pepper and ginger lingering, ending on a light vanilla note. With water, there's less waxiness, but a bit more smoke coming through. However the flavours aren't as clear with water added. This is definitely better neat. The bottle has changed over time, with the waxiness fading and the smoke becoming more prominent. If I buy another bottle (quite likely), I believe I'll use Private Preserve, as I really liked that waxy component. But it's always a worthwhile experiment to see what time and air exposure do to a whisky. I probably would have rated the first 1/3 of this bottle about 89-90 points. After a few months of air exposure I still like it, but not as much as before, maybe 86-87 points. So I'll split the difference here. @OdysseusUnbound, I agree: Kilkerran 12 is a fine whisky, but Springbank 10 is better. Have you had the 8 CS? I believe you like some high-octane drams, so you should give it a whirl if you get a chance. As long as the 12 and the 8 CS are Kilkerran's options, all my money will be going to the 8 CS. @MadSingleMalt Lucky for me, a friend sent along a generous (50ml) sample of the Kilkerran 8 Cask Strength. Looking forward to trying it. 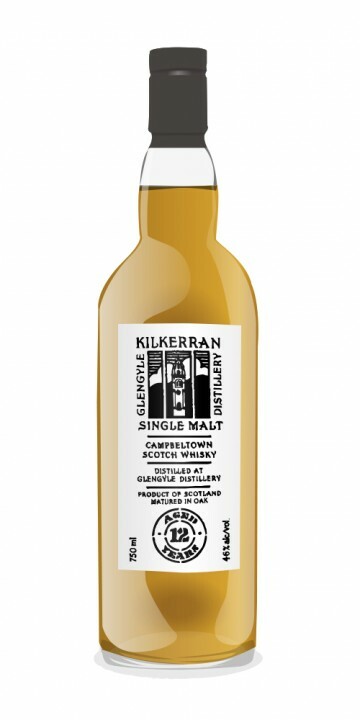 So, after a lot of "Work in Progress" releases (nice idea, though I haven't had any opportunity to try any of them but I'm curious about a few as they have had raving reviews) Kilkerran has now released their standard 12 yrs bottling. First time I comment on design, but I do like the bottle! Comes in a sturdy tube (I do like those) and it's a non-assuming design without marketing hype which conveys that its the content that's priority No1 for these chaps, which is very pleasant after all the recent marketing hyperbole, Viking legends and peculiar NAS statement that seems to be the latest fad. The nose is very pleasant! It has a malty sweetness which never becomes overbearing, and a light freshness to it. I pick up raspberry flavoured liquorice. No smoke or peat whatsoever. A ting of mustiness, but still youthful and happy. Promises of a great 'summer's dram'. Think of the thick white part of the peel of the gigantic lemons from the Amalfitan coast that the Italians eat and refer to as 'lemon bread'. There are some crispy cranberries in there too. On the palate the attack is slightly effervescent (tingling on the tip of the tongue) and fairly strong (46%), but there's no element of alcohol bite or chemicals. The sweetness carries through - some powder sugar on the attack, and a pleasant oily viscosity. Similar to it's Campbeltown it rather invites to 'chew' on it for quite a while. That's chewing on the lemon bread. It has a wonderful balance and I can't help to wonder what it would be like with just a bit of peated barley. The finish I'd describe as 'warming' and slightly longer than medium. It keeps lingering on for quite a while. And.... and now the tricky part... it's rather salty. Now, this is the one aspect that leaves me a bit ambivalent about this one... it doesn't strike me as the seaside mineral saltiness undercurrent that you'll find in some expression, but more like... table salt, up front. (Oh, I may get stick for this...). Honestly, I find it a little disturbing. Like a greatly executed Spaghetti alle vongole that's been slightly over-salted. Still a delicious dish, but for MY palate... I wish the chef had gone a wee bit more easy on the pinch(es) of salt. (If you scurry around the posts here someone (darn, I can't remember who) copied a link to a great article which deals with the saltiness in Campbeltown, which appears from nowhere, but is ever so present! All in all... a greatly enjoyable dram.. up to that finishing moment, in my opinion. Makes me curious to mix this 50/50 with a Springbank 12 and see if that keeps all the common elements of the two expressions that I love, but tones down that very last element of salty cacophony appearing in the finishing seconds of a hitherto wonderful symphony. I'll give this one a respectable 86. And hope that some time in the bottle may affect it with time and have it approach the high 88 I give Springbank 12. I really like this one and you're spot on with the lemon references. As for "It has a wonderful balance and I can't help to wonder what it would be like with just a bit of peated barley." - try an unpeated whisky after this and then the peat will stand out! I think it's just so well integrated it doesn't shout at you. I think you're the second person recently who has mentioned the salt being a bit much but I really don't notice it myself. A lovely dram. Have you seen a photo of the view through the window of the church which is the picture on the label? @MadSingleMalt was it from you? I've been chipping away at this one for almost a couple of months now and it is a bit of a chameleon malt. I feel I could review this tomorrow and have a distinctly different take on it. This is from a double pour with a few drops of water, in the glass about 20 minutes. Just less than half a bottle remains. Nose is fresh oak, salt, something sweet and confectionery like, sourness, some lemon pith and rind, a peaty tang and an oily industrial note about it. It's complex with a malty core. Taste is a big hit of coal and lemons. There's sweetness present but the sour, salty notes come to dominate as it develops - like licking a lathe that's had lemons smeared on it. Finish is a peaty, tarry salty tang with some mildly astringent tannins. Maybe a touch of sweetness in there as well. Good, oily mouthfeel. Pleasingly malty. I'm imagining being in an old train engine room while the man shovels in coal to keep it chuffing away. There may be a slight fudgy, raisin note on the nose as well but it's worth adding I'm getting over a nasty chest infection and have a slight lingering cold, so not 100% at the races re. my notes. This is an enjoyable and complex whisky but it is definitely not what I'd call easy drinking that's for sure. Tis nay a bad thing, mind. Nicely put. I just had my first taste last night and I can see I'm going to enjoy getting to know this one too. Finish Lemon. Liquorice . Brine . Pepper. It certainly is a treat. @Nozinan I may have to try and convince my wife to let me be the Teacher's Union Rep again. Glengyle distillery, originally founded in 1872, had been closed for more than half a century when it was acquired in 2000 by Hedley Wright, owner of Springbank distillery. Production at the new Glengyle distillery began in 2004 and the first limited release, a three-year old, appeared in 2007. The whisky from Glengyle distillery is not called Glengyle but Kilkerran, as the Glengyle name is owned by Loch Lomond Distillers who use it for their vatted malt. The name Kilkerran comes from the Scottish Gaelic: Ceann Loch Cille Chiarain ("head of the lake of Saint Kieran's cell"), the name of a settlement where Saint Kieran is believed to have had a religious cell and where modern Campbeltown stands today. This 12-year old was released in 2016 and is the first core range product of Glengyle distillery. It is lightly peated (12-15 ppm) and composed of a mixture of cask types: 70% matured in bourbon casks and 30% in sherry casks. The nose is quite malty to begin with, then lemon flavours kick in, followed by notes of cereal and salt. There also are hints of vanilla and grass. Overall, this is a rather austere and dry nose. The palate is medium-bodied and dry. The lemon flavours are back, now together with notes of white pepper and a touch of brine. Then there is light smoke (that I did not detect on the palate), followed by grassy flavours. The finish is of medium length, very malty and peppery. Flavours of lemon and brine make a reappearance, the end is oaky and dry. This is an austere single malt that appears challenging to access in the beginning but starts to show its qualities after a few sessions when it becomes highly drinkable. I am very impressed with the exquisite balance between sweet and dry flavours and with the overall complexity. This is one of the better whiskies it has been my pleasure to sample so far this year, and it is top quality at a very fair price. @Pierre_W, thank you very much for your informative review. I look forward to one day tasting Kilkerran 12 yo. Thank you, @Victor, it is good stuff, highly recommended. I am just now sipping a glass of their 8-year old cask strength release - equally highly recommended! It took many years, but at last the standard Kilkerran has arrived. After all those Work in Progress (which were quite nice indeed), it is nice to finally see this new release at a very fair price. Not even 50 EUR for this big boy. And indeed it is a big boy. Wonderfully old school whisky in my book and hence a bottle I think should be in each and every cabinet. Chalk and lemon juicy, that’s the start of the nose. Very clear and clean. Oat meal, mint and spices from the kitchen rack. Think rosemary and thyme. Hay. Hint of soot. Stable scents in the background. Hint of peat. Some rotting wood. Old school indeed. Wonderful. Idem dito on the palate, but the peat is now much more outspoken and the whisky turns quite salty from the very beginning. A bit waxy (but less than its predecessors). Some exotic fruit seems to want to reach the surface, but fails by an inch. Lovely little peppery touch. Again that chalky element, that I really love in Kilkerran. The finish is medium long with a bit more smoke and another salty uppercut. At last, indeed. Top whisky at a top price. Now, how about a cask strength edition? About five years ago at my clubs' monthly mystery tasting I decided to take with me a relatively unknown whisky. Well, unknown to most of us, that is. It was something I picked up on a whim without really knowing anything about it or the distillery. That whisky was the Kilkerran WIP 4. Met with many a raised eyebrow and unabashed lip smacking it became an instant hit at the gathering and ultimately my obsession. For those who know me know two things about me. Number 1 : I have a mild case of OCD. Which means if you give me something that is numbered and part of a series then I will move mountains to make sure I have the entire collection. It's a sickness, I admit it. Number 2 : I am irrationally fascinated by Campbeltown whiskies. No rhyme or reason. Just am. Now imagine my state when you put both those things together. Even more so when the spirit in question is just so damned delicious. And, thus, began my quest to collect all the WIPs. Glengyle Distillery, makers of Kilkerran, released the WIP 1, which was a five year old whisky, as a way of sharing the spirits' journey until it's final form as a 12 year old. Also no doubt as a crafty means of generating revenue which is fine by me. This was, you guessed it, followed by the WIP 2 and so on until last year they released their last and final WIP (the 7) which was a stunning bourbon cask bottled at cask strength. And, finally, around two weeks ago they released their standard entry level - the 12 year old. I have been following this journey for a while now and was understandably excited when they announced the release. After making my pre-order I somehow managed to have it with me for a tasting I hosted a couple of nights ago. Geeks that we are we didn't try it straight and instead decided to do a vertical with the WIP 5,6 & 7 followed by the 12. Immediate grill charcoal. Faint coal smoke. Almost industrial diesel. Not in an overpowering way but in a way that only Campbeltown can make appealing. Himalayan pink salt. Green olives in brine. Mexican lime. Vanilla. Very mild honey. Wild heather. Dry flowers. Love the nose. There's an old-school oiliness to this that I love. Touch bitter. But in a good way. Vanilla. Sweet lemon. Touch of oak. Consistent layer of smoke. Wet pebbles. That salt again. Get's sweeter mid-palate. Butterscotch. And then black pepper pricks. Solid. Medium to long. Oak. Lindt 90% cocoa. Ceylon black tea. I love it. I love the WIP 7 a bit more but this one is quite lovely. I love it because there is an element of old-fashioned whisky making that somehow comes through it's oiliness and the fact that it's more savoury than sweet. Something which I really like in a whisky. This might not be everyone's cup of tea but it certainly is mine. What I appreciate even more is the highly affordable price tag. Under 40GBP in a world that has gone crazy is something to be lauded. So thank you Glengyle for not being greedy gits. And for producing this gem. @MaltActivist Thank you for the answer and the advise. I was able to spot the Kilkerran 12 and the WIP6 (Bourbon finish) near somebody I know but now I have to get in contact with that person and convince her to grab it for me. I hesitate because that person (my niece) has recently been very helpful in getting very good stuff and I don't want to alienate this fine ressource. I also have to admit, I am currently short on my whisky money. I read very good review of the WIP6, where would you rank it compare to the WIP7 and the 12 yo? MaltActivist, how prominent would you say the salt is on this one? I'm gonna buy one regardless when it appears around me, but I'm wondering how much of that big Campbeltown salt hit I can expect. When I first tasted a Campbeltown whisky (a vatted mystery malt that's probably nearly all Springbank, from behind the counter at the Edinburgh Cadenhead's), I was blown away by the sea-saltiness. I loved it. When I subsequently first drank a Springbank 10 back home, the salt was still there and I loved it again. Since then, I've been chasing that character and finding it less and less. The reason is probably my acclimation to heavily peated whisky (rather any broad changes in whisky), but nonetheless, I keep looking for something that will make me feel young again, as it were. I've found it to varying degrees in the Kilkerrans I've had so far, but nothing huge. Serge's review of the new 12 really emphasizes the saltiness, so I got my fingers crossed for this one.